A new educational campaign is aimed at breaking the cycle for the chronic homeless. 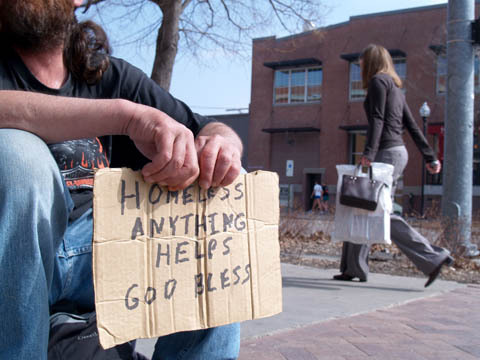 CARDBOARD REQUEST - Tim, a 44-year-old homeless man, holds a cardboard sign as an individual walks by in downtown Lincoln. A new campaign aims to direct people to give donations to Lincoln organizations that help the homeless rather than giving directly to panhandlers. Photo by Troy Fedderson/University Communications. Tim never intended to be homeless. The capstone donation is in place for the development and naming of UNL's new multicultural center. Prices for parking permits will begin going up to raise revenue for a new 1,200-spot parking structure east of Abel-Sandoz residence halls. A reference list of childcare providers is available to assist faculty, staff and students affected by the April 27 closure of the University Childcare Center. UNL was one of 41 Division I member institutions certified by the National Collegiate Athletics Association. The announcement culminates a multi-year project involving UNL chancellor Harvey Perlman, Athletics Department administration and staff, and others. The Interfraternity Council, consisting of presidents from the 23 UNL Greek fraternities, passed an amendment to its by-laws April 11 requiring all fire alarm systems at UNL fraternities to be monitored by an approved supervising station. This will shorten the notification and response times of fire department units to each structure. "Killer of Sheep," one of the first 50 films selected to the Library of Congress' National Film Registry, opens April 20 at the Mary Riepma Ross Media Arts Center. Kearney artists Martha and Del Pettigrew are creating two clay sculptures as interactive artists-in-residence at the Great Plains Art Gallery through April 27. The School of Music's Chiara String Quartet is about to embark on a statewide tour of Nebraska to bring its unique chamber music experience to communities across Nebraska. The UNL Clay Club will host the Annual Spring Ceramics Sale, 9 a.m. to 6 p.m. April 27, and 9 a.m. to 5 p.m. April 28, in Richards Hall room 118. Complete details of nearly 2,000 native and naturalized Nebraska plant species can be found in "Flora of Nebraska," a new book from UNL that ranks among the most comprehensive and definitive of any detailing Nebraska plants. Sheldon Memorial Art Gallery has initiated a new program, "Sheldon Connections," which aims to transform the museum's exhibition spaces on the north side of the second floor into a dynamic public site from July 13 through Oct. 14. The second annual UNL Staff Art Exhibition will be Nov. 5-16 in the Nebraska Union Rotunda Gallery. For more information, including how to enter the exhibition, contact Valerie Bender at vbender1@unl.edu.